What if you could do more than spread holiday cheer to your group this Christmas season? What if you could give gifts that spread faith, hope, and love? Relieve fear, stress, and anxiety? Point to Christ through Scripture? These Christmas resources will equip your group members to finish off 2018 with a focus on Christ and catalyze them into Gospel-centered living as they enter 2019. This 10-Minute Audio Devotions CD contains twelve audio devotions by best-selling authors that will inspire you to find strength in God as you set your mind on eternal truths from His Word. This 10-Minute Audio Devotions CD can help you deal with the crazy twists and turns on the road of life, especially when you’re on the road. They can be perfect for commutes but can also be used anytime you have a free ear and a few minutes of downtime: exercising, folding laundry, tinkering in the garage. Brief but powerful, these audio devotions will help you navigate through fear, stress, and anxiety while covering topics such as renewing your mind, overcoming various fears, the role of suffering, and battling temptation. The two-disc set containing 12 devotions, each about 10 minutes in length, features teaching from some of today’s best Christian communicators including Tony Evans, David Jeremiah, Matt Chandler, and more. Jesus’ first appearance in the Bible was not in a manger. 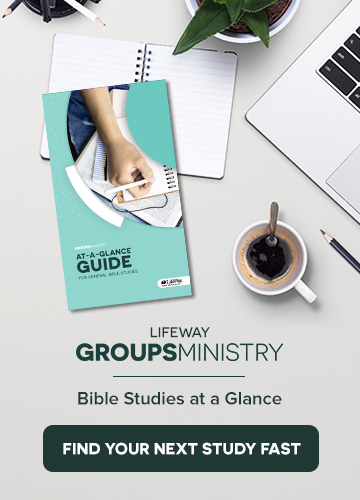 This new small group Bible study series will lead believers on a one-year journey through the entire storyline of Scripture, showing how Jesus is the Hero from beginning to end. Used in sequence, you’ll journey through six volumes, seeing the Gospel from Genesis to Revelation. Used individually, you can journey through any section of scripture through a stand-alone volume. There’s even a student version. What makes it even better? You can try it now, for free. You can download the first two sessions of volume one, take a peek at the sessions of volume two, get free sermon outlines, and see the method behind it all. Find the free content here.